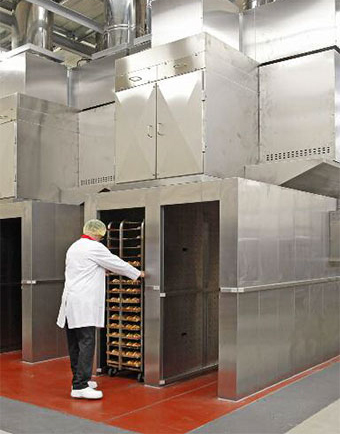 Whether you are looking for a rack cooler, tunnel cooler or a general bread cooler – the Acrivarn range of bakery coolers has the technology to suit the demands of your bakery environment and facilitate quick turnaround of all products from oven to packing. Acrivarn push through cooler units are designed to accept racks of product straight from the oven. Rapid cooling is achieved by forced air blown through a specially designed layout of nozzles to ensure even cooling. All coolers are manufactured using satin finish stainless steel. The cooler design is a monocoque construction in a tunnel format. The Acrivarn coolers can substantially reduce times between baking and packing, for example an Acrivarn cooler using ambient air can cool morning goods for packing in ten to twelve minutes. This unit uses a fan to draw air from outside the bakery via a flue. The cooling air is filtered through F9 grade air filters and is blown across the trays of products from the delivery side of the tunnel, the opposing side draws the air across the trays via a second fan and exhausts the hot air from the bakery via a second flue. The temperature of the incoming air is monitored constantly and a thermostat controls the dampers to blend exhausted air with incoming air to achieve the optimal air temperature and prevent drying the products. Washable grease filters are fitted to pie, savoury and meat coolers. 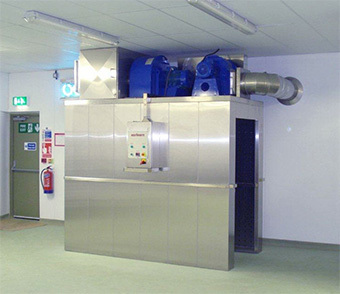 This unit uses air drawn from within the bakery to cool the products and is ideally suited to morning goods.